just 1 question , after 2 days composite exam is going to expire. TI 5.25 is available on net for free, I dont thing someone will share 5.25 TI now or even P4S 3.10, Considering the fact that 3.10 is not avialable any where. If possible make it free please. Please done mind if I have said anything wrong. its just a thought. 🙂 Thanks for all the shares. Nothing has been updated in 642-892 p4s on june 20th. It is just a change of date on website. I have purchased the Composite in GB, now i need the updated questions released on June 20. Plz update me the procedure as you mentioned that next update is free. I just contributed to GB. I do hope this would help me for my examination. I'm taking the exam first week of July..
Hi, Thank you I was able to purchase both testinside and P4S for 642-892. New testinside will be ready within 24 hours. Hi Carrercert, How can I buy Testinside for 642-892 it says that the offer is closed? Is there any other option. Please update. hey careercert i belong to pakistan nd i want to buy these dumps but in da country tab pakistan isnt present! how cud i avail ??? Latest 642-892 pass4sure v3.10 PDF has been made according to topics with bookmarks. The questions and answers are now on separate pages. It'll help to practice better. Plus the contributors will now get updates till 31st july. i.e for 3 months !! P4S v3.10(614 Q) is not crackable. So patched setup can not be made from it. Soft copy can't be installed on more than two computers. It require order and serial numbers which works for only two pcs. So screenshot PDF is the only way. 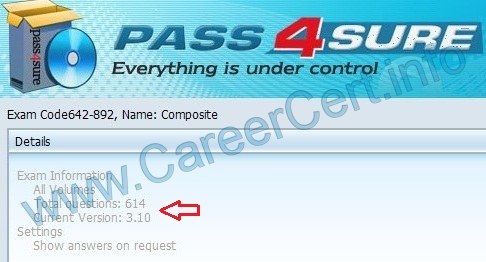 Pass4sure 642-892 v3.10 – 614 Questions- Feb20, 2010/U have Soft copy Not a pdf …..I want….I Buy the soft copy not a pdf…pls give me…..
dear all, i hav downloaded pass 4 sre ,6.99 ,for ccnp composite exm ,plz let me know its useful or not..
May the success be with you ! hey guys has anybody taken composite exam recently please tell me what where the labs, drag and drop and simlet. your input will help me thanks. Is there any Lab training materials for CCNP composite exam? Passed Composite today, 983/1000. TI 5.24 110% valid. Thanks CareerCert for your help, I'll contact you again for CCIP dumps when am done with the coursework. Thanks again! really glad to hear that ! I cleared my composit exam on 25th of this month with 966 marks.All questions are from TI(229 Q,s). there is a problem with radius server lab after the configs i have done i came to know that copy run start command is no operational then i try the write command but the result is same. I think that sandy face the same problem few days ago.If any body planning to write composit then TI is best and enough. Career Cert now i am a CCNP and in achieving this, U and yur site play a BIG role and i am really thankful to u. Keep the excellent work going on as u are doing a work of charity as every body is not BILL Gates. Any body wants any Assistance contact me on this blog. is there any body have took exam in last few days…comment please! Hello sandy, I see you did well in your composite exam. I was wondering if you could send me a link to where i could get those dumps real quick. Becos my own exam is in a few day & iv used CBTNuggets bt i wud luv to use the Test Inside V5.24 to prepare finally. Good Luck Farhan! Please do share your experience, Thank you! yes you can use labs of bsci and bcmsn for preparing the composite exam. There is no difference of labs between these exams. i have a question for u. can i use the Ciscosims.blogspot,s labs of BSCI & BCMSN for preparing Composite exam. is there any difference between Composit labs And BSCI & BCMSN labs. waiting for reply as my exam is due on 25 march. survey is not necessary. It doesn't affects the selection of questions. You can just skip the survey and go direct to exam questions. Is the survey that cisco take before exam in which we tell how much time we take in preparing this exam effects the selection of pool for exam. i used CBT nugget, V5.24 and passsure 6.85 ver(but it is not required). Hi, ALl the ques. is came from the TI v5.24 only. i faced one issue in one sim. (radius server configuration) in this sim copy run to start command was not working. V5.24 is more then enaf for composite exam. Anyone took this exam recently? If yes, and you prepared from TestInside 642-892 Ver 5.24. How much did come from this dump? I have composite exam on 29th, please share your experience, Thank you! Congrats Sandy!!! I am taking composite on March 29th, could you share you test experience? Which dumps you used and how much was from them? Thank you! Hi Sandy Congrats. Can u plz share yur experience of exam, and what material u use for exam preperations with the Blog as many of us is willing to give composite in the near future. Yes, you will get latest exam engine setup and PDF. If any update occur, i'll send it immediately within 24 hours. If i contribute towards this GB, do i get TI latest exam setup along with PDF? I have exam by the end of this month, if dumps update before that could i get them before the exam ASAP? Thank you! Testinside is more accurate and close to exam format. Note:- The Feb4 update has been delivered to all previous contributors. New Feb 4, 2010 update is ready now. If you have contributed in the older one, you'll receive the new update within a few hours(before Feb-6). Kindly wait for some time.